I know you must be thinking I'm barking mad to be writing a review on exfoliating gloves (and I probably am) but hear me out. I picked up these cute Soap & Glory ones a few weeks back along with a bag full of skincare goodies from Boots so having had a few weeks to test them out I can finally tell you that yes they are worth the full £4 price and are definitely the best amongst cheaper versions out there. First off they are pink which means they won't look grubby after a few uses and they are so much thicker compared to other versions. They also fit quite snuggly on your hands and just make the whole process of exfoliating a lot easier. The best way to use these is obviously in the shower with plenty of water & body wash, that way they're not too harsh on your skin. If you're a little bit lazy like me these are perfect as you can exfoliate with your regular shower gel and not have to use an extra body scrub. Using this a few times a week leaves your skin feeling super smooth & soft with no dry skin patches in sight. Since were focusing on Soap & Glory right now, I might as well tell you about my favourite shower gel to use along with the gloves. Of course I'm talking about the Soap & Glory Sugar Crush Body Wash, sweet & citrusy, a pleasure to use in the shower. It's the perfect 'wake me up' in the morning which leaves you feeling refreshed and energised. Priced at £6.50 for a shower gel it's definitely a treat and not something I splurge on all the time. On the plus side the bottle is HUGE and it has a handy pump meaning you're not going to waste any product, so it will last a good while. I've never used exfoliating gloves before but I think in might try it as I'm always too lazy to use a body scrub! Haha. Those gloves seem awesome! I've been looking for something to exfoliate with but only found those horrible rough sponges. This I have to try! I've never used exfoliating gloves before, but this ones sound fab! I love S+G- those gloves look like something I need in my life, even if it is just because they are pink! Have you tried Foamous Shower Gel? It is my favourite one from them- and you're right about the bottle lasting forever. Mine is still going strong months later! 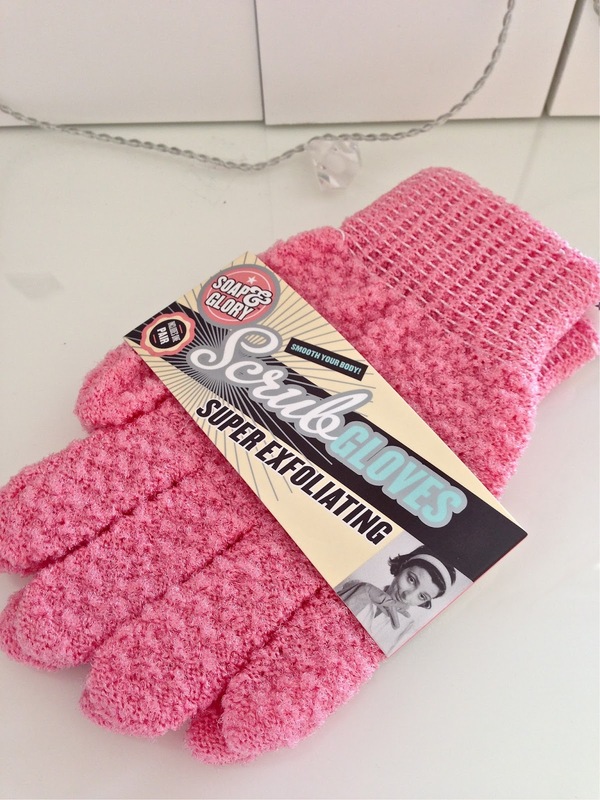 I always run out of body scrub so quickly, I might have to try these exfoliating gloves out! And that shower gel smells amazing, I'm really sad I've managed to use all of mine up! I've also nominated you for a Liebster Award because I really love your blog :) If you'd like to answer my questions you can find them on my blog! Haha omg if I had those gloves I'd literally never get out of the shower! I keep my shower stuff pretty boring and simple bc I don't want to waste time there, I know me lol I'd be playing with those things and realize I have wasted oceans of water.. oops! I love Soap and Glory! I usually get the large Clean On Me and it lasts about 6 months! I really want to try Sugar Crush - it sounds gorgeous. Might have to try these, thanks! I had a nice pair of exfoliating gloves but my kiddos got a hold of them and well, you know how that goes. I'll have to check the Soap & Glory ones out the next time I'm in Sephora. Lately I've been loving Bliss body wash in vanilla. It smells fantastic.